A high blood pressure diet can help you reduce your blood pressure in a very short space of time. Sometimes in as little as a week. It does require a lifestyle change but it can be done. If you are on medication then you should consult with your doctor as to whether you should attempt to follow this diet (really a lifestyle change)and whether to change or eliminate your medication. Some doctors are open to the idea of lifestyle change for high blood pressure and some aren't. I am not a doctor so I can't advise you. I can only talk about my own experience. At a time when I was highly stressed I dropped my blood pressure by 40 points in only 12 weeks and that was with the stress increasing. The pay off of this diet is that not only will it reduce your blood pressure but it will also have long-term beneficial effect on your body as a whole. A high blood pressure diet removes many of the problem foods of the modern era. Things our bodies were not designed to consume or digest easily. It seems likely that early hunter-gatherers did not have high blood pressure, given that the remaining hunter-gatherers today have normal blood pressure that doesn't rise with age. What was different? Simple, their diet and exercise patterns. High Blood Pressure, also known as hypertension, simply means that you have high pressure in your arteries, the vessels that carry blood from your heart to all parts of your body. It is usually given as two figures (e.g. 120/80 read as ‘120 over 80’). The first figure is the systolic pressure and the second figure is the diastolic pressure. Think of Systolic pressure as the maximum pressure and diastolic as the minimum pressure in the arteries. The figures are generally reported in millimetres of mercury (mmHg), though aneroid and electronic devices do not use mercury. Below 120/80 it is normal. Just a high systolic pressure, for example, 160/70 mmHg. Just a high diastolic pressure, for example, 120/100 mmHg. Or both, for example, 160/100 mmHg. If you are above 140/90 or have been diagnosed with high blood pressure then you should consider adopting a high blood pressure diet. Each 20mm rise in systolic pressure, which is the first figure in the numbers above, or 10mm increase in diastolic pressure (the second figure) above normal increases cardiovascular risk by two times. If you don’t know your blood pressure then get it checked because if you do have high blood pressure and don’t know it then you are an accident waiting to happen. If your blood pressure is high (and you know it) you should be concerned but also grateful. If you, or someone you know, has high blood pressure, your body is giving you a warning that if you don’t fix things and change your ways you are heading down a path towards premature death. The good news is that, now that you have been warned it is easy to fix it. Up to 75% of cases of stroke have high blood pressure associated with them and there is also a strong relationship between high blood pressure and vascular disease, congestive heart failure and heart attacks. All of these health issues combined make up the leading cause of death in the United States. Other diseases and conditions related to high blood pressure and its complications include: brain aneurysm, brain hemorrhage, blood clots, chest pain, dizziness, heart disease, fatigue, gout, kidney stones, smell disorders, sleep apnea, and snoring. By contrast, when Staffan Lindeberg studied the Kitavan people of Papua New Guinea ,he found that 'infections, accidents, complications of pregnancy and senescence were the most common causes of death'. Notice: no strokes, heart attacks or vascular disease. Start asking yourself ‘Why is this so?’ Could it be that they are following a high blood pressure diet that keeps their blood pressure low without knowing it? And if it works for them could it work for you? 2) High glycemic complex carbohydrate intake, such as rice, bread, pasta, etc. 1) Start exercising, either aerobic exercise (walk, swim, run, cycle) 3 times per week and/or begin weight training (squats, bench press, deadlift, shoulder press)3 times per week. If you only do one thne do it atb least three times a week. If you combine aerobics and weight training do either one twice a week and the other 3 times per week. 2)Eliminate sugar. This is really important. See my sugar addiction page to see how to do it. 3)Gradually eat LESS concentrated carbohydrates (sugar, potatoes, rice, bread, grains in general). This is basically a paleolithic diet and although it was not meant to be a high blood pressure diet not only will you drop your blood pressure but you will lose weight as well. Check out my paleolithic diet page for more information. If you have been diagnosed with high blood pressure it can be worthwhile to invest in one of the many home blood pressure monitors available. 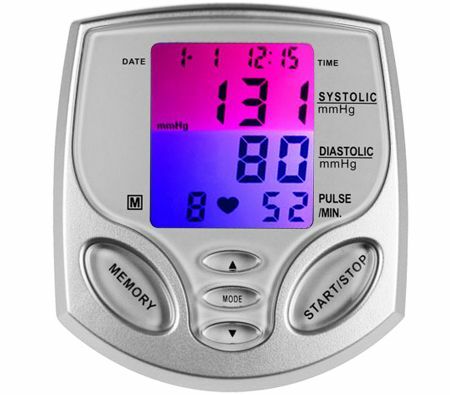 See my home blood pressure monitors page for more info. here. And if you would like a free copy of my book 'The New High Blood Pressure Diet' email me at info@electricphysique.com and I will send you a copy.